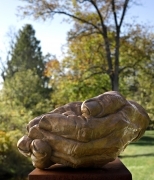 A pair of oversized hands, its fingers interlaced, forms the promise of a sanctuary. The sculpture carries a message of yearning and caring, either it is placed in horizontal or vertical versions. Furthermore, both the seeker of a sanctuary and its giver join in the emotions of hope, anticipation and strength.